10:09 pm - If You Like Anything, You Will LOVE THIS POST! You guys! Nextwave: Agents of H.A.T.E., by Warren Ellis and Stuart Immonen, is the GREATEST COMIC IN THE HISTORY OF EXISTENCE! Nextwave is essentially a parody of superhero comics, specifically the Marvelverse, that is still a fun and entertaining superhero comic in its own right. Actual Marvel characters make what I can only assume are completely out-of-character appearances, but it's not really necessary to know anything about the Marvelverse to enjoy Nextwave. Dirk Anger—har, har (it's not necessary to know anything, but it helps)—director of the Highest Anti-Terrorism Effort (H.A.T.E. ), puts together the Nextwave Squad to combat the Beyond Corporation's tests of Unusual Weapons of Mass Destruction on the American populace. Except it turns out H.A.T.E. is totally in Beyond's pocket to begin with, which doesn't sit well with Nextwave. They go rogue. Their mission: healing America by beating people up. 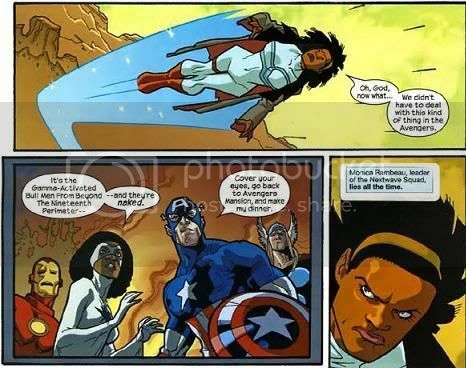 The leader of Nextwave is Monica Rambeau, who used to lead the Avengers. She will tell you this. A lot. Tabitha Smith is a bit of a dim bulb and a klepto, but she blows stuff up. A lot. Elsa Bloodstone is a badass British redhead monster hunter who shoots things. A lot. Aaron Stack, or Machine Man, does not like the fleshy ones. His robot brain needs beer. A lot. The Captain...his name is The Captain! He kicks stuff. A lot. All the characters are hilarious and fun, and very little time is spent on character development. This is not that kind of book. This book is not about complex plots and deep characters and morals. As Warren Ellis says, it is most especially about THINGS BLOWING UP and PEOPLE GETTING KICKED. There are so many explosions in every single issue; it is AWESOME. And they're not even gratuitous explosions. Things just happen to explode a lot when Nextwave is around (especially since Tabby's mutant power is blowing stuff up). The Beyond Corporation is testing some very...unusual biological weapons. Besides all the ridiculous enemies they face, the comic itself is incredibly funny because Ellis throws in tons of meta gags about the characters and the story and the comic itself, poking fun at various comic book conventions (er, writing-wise, not Comic-Con-wise). It's like combining the fourth-wall-breaking humor of Scott Pilgrim with the zany cracktasticness of The Umbrella Academy. Nextwave is like The Umbrella Academy but without any pretense of being serious. They both gave me a similar "This is so fun and wacky and out there and I LOVE IT!" feeling. They also both have great art. "Monica Rambeau can convert part or all of her mass into any form of electromagnetic energy in the spectrum. Except the ones they make up on Star Trek." "You have bought an episode of Nextwave unless you stole it off the Internet." "You have violated my gate of fire! Which is not the title of an adult movie!" I laughed out loud while reading Nextwave. A lot. Nextwave is so awesome it even has a theme song that declares, "It's like Shakespeare but with lots more punching!" For some mystifying reason, the comic didn't sell well and ended after twelve issues, but Ellis does provide an ending that makes it feel like a successful miniseries rather than a dead-before-its-time ongoing series. I cannot believe I went this long without reading Nextwave, and I am Dirk Angry that there is no more! Don't make the same mistake I did! Read Nextwave now! I cannot say it any better than the blurb: If you like anything, you will LOVE NEXTWAVE! BOOM! I am sending this to Littlest Sister! It sounds potentially right up her alley. It is right up everyone's alley! It goes right up your alley and kicks you in the face! It was right up Littlest Sister's alley when she read it several months ago! Sista, you are behind the times once again. Hi again, spectralbovine. I may reread Nextwave soon, it was a lot of fun. Ellis usually is entertaining, even in his more serious works! It was kind of like Transmetropolitan minus all the philosophizing about journalism and politics and human nature, and plus a great deal of explosions and drop bears. I have not read Transmet yet, but I am certainly more eager to now! I did not realize you had never read Nextwave. I found it last year sometime and fell out of my seat laughing. I regularly loan my copies out to people to spread the love. However, I didn't know that it was dead and done and there wouldn't be anymore. Which makes me a little sad. But I'll just keep rereading what I've got. whee! I borrowed my copies from Seanan. And, man, I was laughing on BART, laughing while waiting for a show, laughing at lunch, laughing in my apartment. I think people were giving me funny looks. The title didn't sell well enough to be able to afford Immonen, and Ellis wouldn't do it with another artist. Apparently there were supposed to be some miniseries later on, but I guess those never came to fruition, like the mythical Avatar specials we were supposed to get this year. It was like the comic was watching me. Maybe I should buy it, though, to like, reward it for being awesome. I need to reread it anyway, since I'm playing Nextwave!Monica in my friends Marvel game. Alas! I am a Marvel guy. that doesn't stop it being awesome, even if I don't get all the in jokes. Maybe I should buy it, though, to like, reward it for being awesome. Heh, yeah. I'm waiting to see what the Ultimate Collection is like. They're collecting all twelve issues in one trade that's coming out in March, but I don't know what sort of bonus material will be in it. Or whether it will include "If you like anything, you will LOVE NEXTWAVE!" on the back. Because I kind of want the copy I own to have that so I can read it and laugh all the time. I'm playing Nextwave!Monica in my friends Marvel game. It's utterly random of me to comment, but I have to wholeheartedly agree: Nextwave is awesome. I just need to get my own copy instead of treating friends' copies like crap. It's not that random! I know and like you and welcome more comments. Nextwave was totally hilarious and awesome. "All I have is two Uzis and a shovel. And guns don't work on samurai, so all I have is a shovel. Rock." "Fing Fang Foom put you in his pants!" Ha, I didn't know that about Drop Bears. Good times. And I didn't realize Fin Fang Foom was an established Marvel character until I Googled. Heh. You have actually conflated two awesome moments. The first line goes to "So I guess I can shoot things and bury them." It has been a few years since I read it, but I thought she did that bit both ways. "I've got two Uzis and a shovel. Which, I suppose, means I can shoot things and bury them afterwards." "Samurai robots beat guns. No question. So it's just me and a shovel. Rock."